With Halloween coming up I thought this would be appropriate. I’ve seen several Halloween costumes with tutus including all the Disney Princesses and much more! I made these tutus for a recent craft fundraiser. They are very inexpensive and easy to make. You can make a DIY No Sew Tutu this size (Toddler) for about $5.00. Note: I did a scrap T-shirt skirt tutorial a while back. 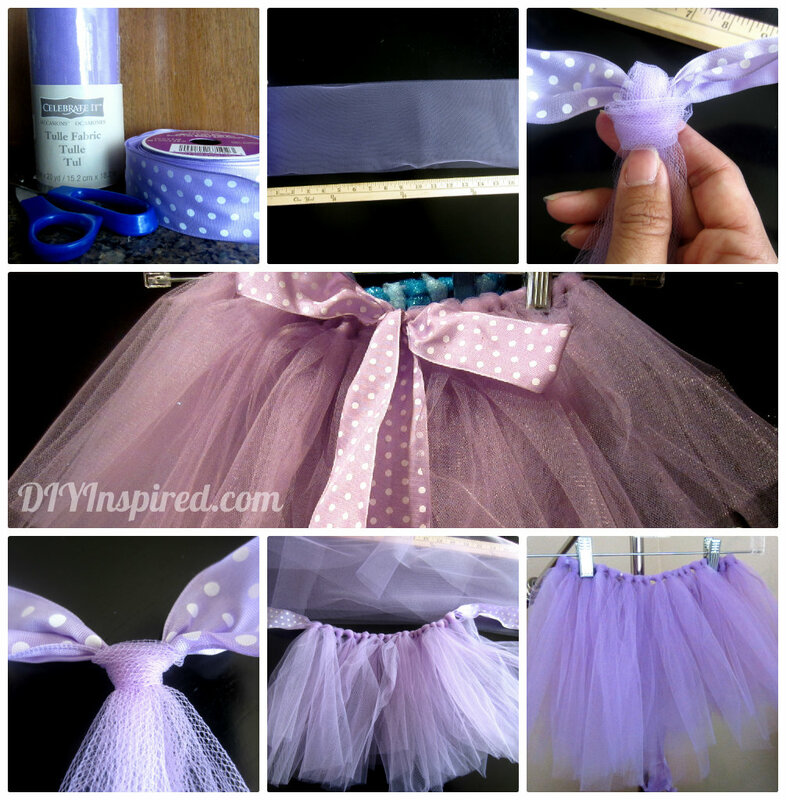 This tutorial works for tutus as well. The difference are 1) the materials chosen, and 2) I also used an elastic dollar store head band, which works great for this tulle DIY No Sew Tutu as well. Materials: These are the measurements for a Toddler sized tutu. Note: Yards of tulle at a fabric store is much cheaper, however pre-cut rolls like these make it more convenient and simple. Consider buying from a fabric store if you are making a larger (or longer) costume. First, using the yard stick as an aide cut the entire roll of tulle in 20” strips. One by one fold each strip in half and knot it around the ribbon as shown. Make sure you start in the center of the ribbon and make your way out. When you are finished the skirt will be about 20” around. You can slide and maneuver the tulle to make it a little smaller or wider as needed. Cut the ends of the ribbon in an angle and use clear nail polish to stop the ribbon from fraying. Tie the ribbon in a bow. Consider making a green skirt for a Tinker belle or mermaid costume; a blue skirt for Cinderella; a pink skirt for Sleeping beauty; a yellow skirt for Belle; or a blue, yellow, and red skirt for Snow White. If you need more fundraiser ideas, check out my YouTube video for the other crafts I made for this fundraiser. I tried to replicate it into the Queen of Hearts costume (the one that you made). I’m having a dress up theme for my 21st and want to go as the Queen of Hearts! I made the skirt today but it’s really really puffy and big, I had less tulle but it was see through (and still really puffy). Is there any way you could possibly give me some advice? I’m not sure if I made the coloured panels too thin, (the first few were about 10cm or less, but then the next few were about 15-17 cms once I ran out of material and had to buy more). Any thoughts? Or is the costume that you wore for sale at all? Would love to hear from you! Hi Emma! I’m glad you like it and Happy early 21st!!!! The thickness of each strip I cut was about 2 inches wide, so approximately 5 cm. I’m wondering if your strips are too thick causing it to be so see-through? Try thinner strips. Mine was a little see-through, but I wore black tights under them. I love this idea. I want to make.one for myself. But I would like to know roughly how much tulle you used for an adult? So I can see how much this will cost me. Thank you! Hi Shannon! I think I used between 5-7 yards for mine. Hi! I’m looking to make this and wondered if I could wear it with tights? do the strips separate when you walk around with it? also how much of each coloured material would you use for the queen of hearts design?